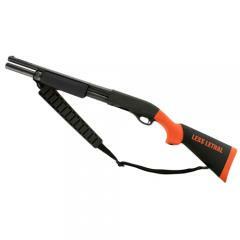 This overmolded shotgun stock from Hogue fits the Mossberg 500, Winchester 1300 and Remington 870 shotguns, replacing the factory stock. Its bright orange markings and bold "LESS LETHAL" text mark it out as a less lethal weapon, ideal for riot control and self defense situations. Its durable fiberglass frame is overmolded with wear-resistant synthetic rubber, with a non-slip textured surface that provides secure contact at the shoulder for stability and accuracy. The material resists corrosion and damage from firearm solvents and oils, ensuring that it won't degrade over time. The soft material is comfortable to use and also helps to reduce the shock of recoil.